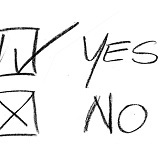 Sometimes, people will tell you “no” even though you deserve a “yes.” It could be a client refusing to pay for your services, a boss refusing to give you the promotion he promised, or even a customer refusing to buy your product. Persist, and you will succeed. Write it in large block letters. Place it where you will see it frequently. Ideally, it should be the first thing you see when you wake up in the morning and the last thing you see every night before you sleep. Whenever someone tells you “no” when you deserve a “yes,” don’t give up. Stay firm in your resolution that you will eventually get a “yes,” and keep working toward it.